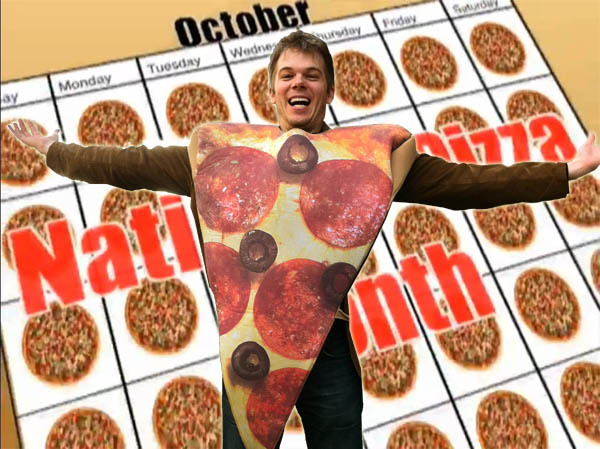 A "Slice" of My Pizza-Obsessed Life! My favorite pizza resource, SLICE, interviewed me as part of their "Pizza Obsessives" feature and I couldn't be happier. 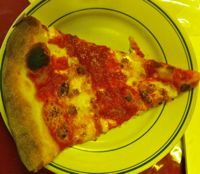 SLICE top the charts in a recent post by the Culinary Arts College ranking the top 24 pizza blogs (31 Days of Pizza proudly made the list as well). Thanks to a costume lent to me by Scott Wiener (of Scott's Pizza Tours) and graphic design by Robin Rothman and Shawn Amaro, I was virtually transported into fantasyland - sort of like TRON for a pizza lover. Speaking of putting forks in things, October may be over but that's just the 31 days of eating. The reviews, videos, and awards are coming soon, so stay tuned! From the outside of Sam's Restaurant, you wouldn't guess that this is a place to get high quality brick oven pizza. Heck, you might not even think the place is still in business. But it is and has been for over 80 years. If there is any doubt look no further than the retro neon lights and vintage hand-painted signs clearly representing yesteryear. One step inside and the place opens up revealing a wide-open dining area, a full bar, and walls plastered with iconic photographs of older times. You might think you stumbled onto the set of Sopranos. This could be because you have. 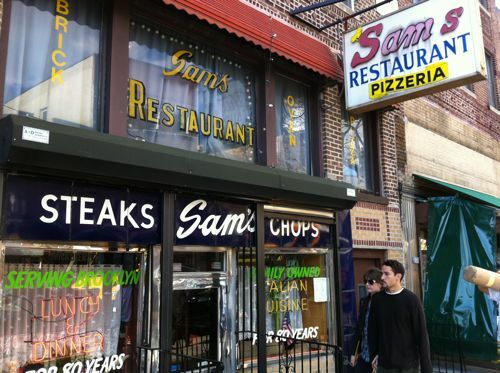 Sam's Restaurant has been featured on the Sopranos and the photos with James Gandolfini and other cast members indicate it is a source of pride. Sam's Restaurant should also be proud of their pizza. 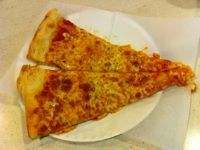 Louis Magliaccio, the current owner of Sam's, eats a slice of his own pizza nearly every night for quality control and, well, because he loves it. He is also constantly scouring the market for the best tomatoes for pizza sauce. The sauce on our pizza was the result of multiple types of whole peeled Italian tomatoes combined with rich tomato puree and infused with other herbs and spices. There was also copious amounts of it beneath the creamy Polly-O mozzarella. And the crust kept it all together (in more ways than one). It was firm enough to contain the toppings yet chewy enough to eat by itself illustrating one of the benefits of eighty plus years of food preparation. Bring cash and plenty of time as Sam's does not accept any credit cards nor any "attitude." The flip side of "not rushing the guests" is that service does not want to be rushed either. I love the personal attention we received from Louie, the owner/waiter/bartender at Sam's. 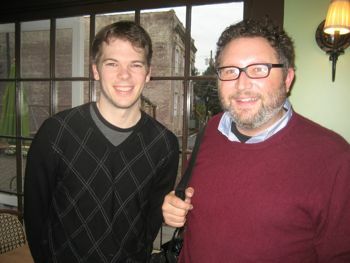 I also noticed the other guests getting a chance to converse with him as well. He's a friendly guy. Of course, if you don't want a new friend or a new favorite pizzeria, you probably should go elsewhere. 1. 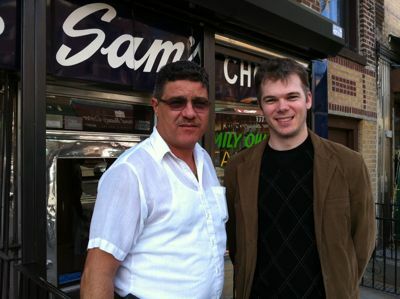 I met Louis Magliaccio, the owner of Sam's Restaurant. His father, Mario used to own Sam's so everyone assumed his father's name was "Sam," thus making him the "son of Sam." Louis prefers not to be called that. 2. This was the last pizzeria on Scott's Pizza Tour of Brooklyn. By the time it ended I was so full but Scott warned, "Around 7pm, you will get very hungry again." He was right. The quintessential South Brooklyn slice and a thin, saucy grandma. 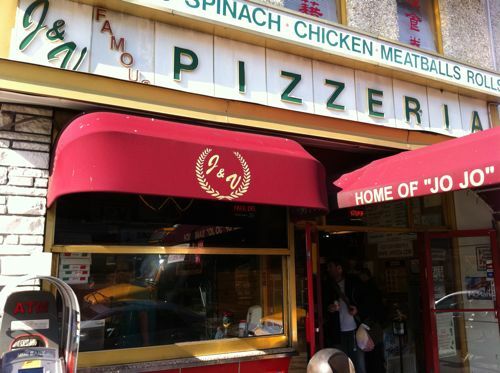 Since 1950, J&V Pizzeria has been setting trends for New York pizza and creating new ones of their own. The name "J & V" comes from the first names of founders, Johnny Mortillaro and Vincent DeGrezia. When the Sicilian born Mortillaro teamed up with the Neopolitan born DeGrezia, a perfect pizza union was born. 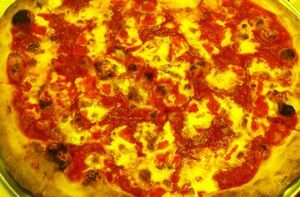 Given their heritage, it is no wonder J&V specializes in multiple styles of pizza. 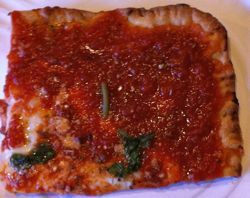 In addition to Siciian (square) and Neopolitan (circle), J&V also offers their signature twice-cooked grandma pie. All are cooked in a multi level rotisserie oven. Every pizzas get plenty of tomato sauce, the industry's best Grande mozzarella, and dough made from a secret family recipe. The net result is a top quality slice no matter what style you choose. Over the past sixty plus years, J&V's Neopolitan cheese slice has become the industry standard cheese slice, a standard only the best pizzerias ever attain. The most unique pie on the menu is the signature grandma pie. Pushed flat into a cookiesheet with a layer of cheese, the pie is placed in the oven for the first time so the dough is not given time to rise. Then, after being loaded with sauce, herbs, spices, and olive oil, it is then re-introduced to the rotisserie oven. The final result is a crispy thin yet surprisingly filling packed-with-flavor square slice of pizza that will make you want to come back even before you've left. I look forward to re-visiting this Bensonhurst institution. Their website indicates a new location will soon be opening in Manhattan which could mean they might even be coming to me! 1. J&V is also known for their chicken rolls and the celebrated "Jo Jo sandwich." 2. This is Ronnie Palmer's favorite slice. He's the bus driver for Scott's Pizza Tours.